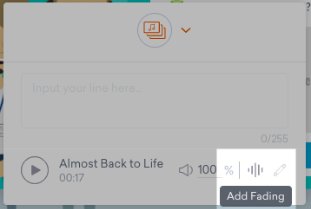 1) Right click or CTRL+CLICK on an existing audio clip in the timeline and select Settings. 2) Adjust the volume by adding a number between 0-100 and hitting Enter on the keyboard. 3) Adjust the begin level, end level, and duration values. 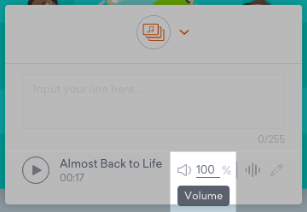 Begin & end level indicates the volume percentage at which the clip will start or end (0-100%). Duration indicates how long the fading will last (e.g. volume will decrease for 2 seconds). 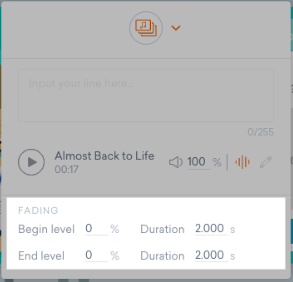 Pro-tip: audio clips that have fading applied have a slope at the beginning and/or end of the sound clip in the timeline. This indicates when sound will start increasing or decreasing volume. 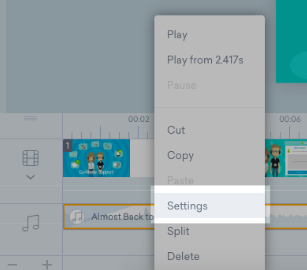 To add multiple fading effects to the same clip, apply the Split option to the audio clip in the timeline and adjust fading for each individual section.